We offer turnkey solutions that combine our crisp, clear HD panels, flexible mounts and state of the art video processors into powerful, easy to operate systems. Our LCD Display Walls combine our crisp, clean LED backlit panels and state of the art Video Processors into a powerful turnkey solution that allows you to present your information in vivid, sharp HD video images. If you can image it, we can mount to it. Now you have the freedom to display your information anywhere you choose. 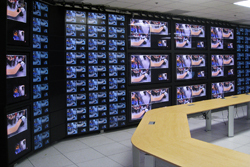 A single video wall can be used in multiple locations as the need arises, greatly increasing the utilization of the asset. 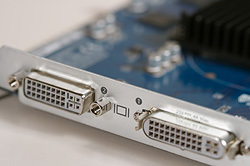 Our video wall Processors are at their heart high performance graphics computers designed to drive video walls. 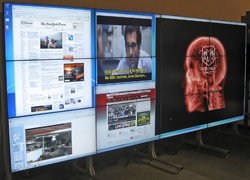 Our processors are scalable in both the number of LCD panels in the video wall and the number of video inputs required. The modular system architecture of DAV removes the limitations of a traditional fixed platform I/O matrix system without compromising quality or reliability, whilst offering significant cost savings when designing large scale installations. 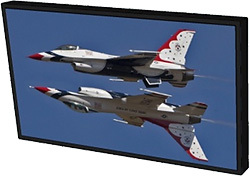 Now you can enjoy all the superior benefits of an LCD panel such as sharp, crisp images, consistent color and brightness between panels and long panel life in a video wall with virtually no bezel.